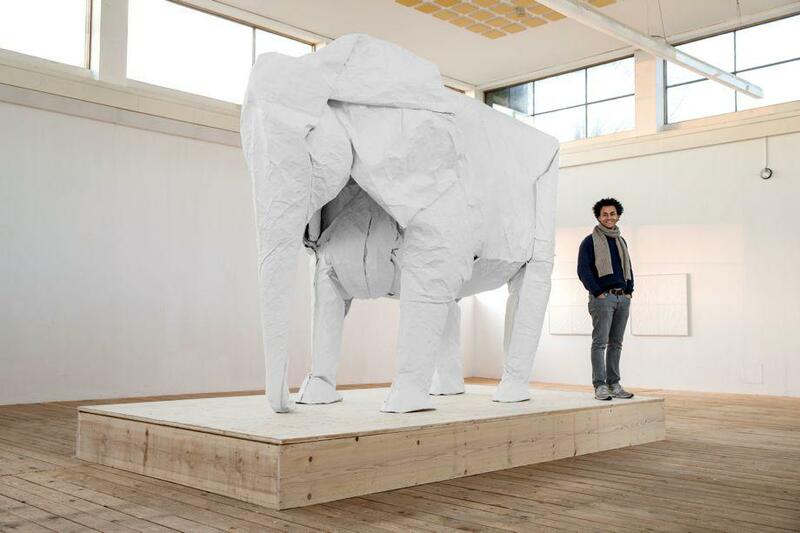 Time-lapse video of the making of a life-size origami elephant by Swiss artist Sipho Mabona (VIDEO). The life-size origami elephant by Swiss artist Sipho Mabona weighs roughly 550 pounds and is nearly 10 feet high. It is currently on display at the KKLB museum in Beromünster in Lucerne, Switzerland. Last time we checked in with Swiss origami artist Sipho Mabona, he was in the midst of launching an Indiegogo campaign to raise money to achieve his ambition to fold a life-size elephant out of a single sheet of paper. The other day he wrote to let us know that after four weeks of working with up to 10 helpers at a time, he did it! And here’s the 37-second time-lapse video to prove it. The project was crowdfunded by more than 600 contributors from around the globe. The elephant is currently displayed at the KKLB museum in Beromünster in Lucerne, Switzerland, but Mabona noted that its future remains unclear. For one thing, the life-size origami elephant is too big to squeeze through the windows or the doors of the museum.